Rediff.com » Business » Railways to IAS: Where are the Women? Women's representation in government jobs is less than 15%. Going a step ahead of the long-standing demand for women's reservation in Parliament and assemblies, the Congress has promised women a third of seats in new government jobs if voted to power. The enormity of this challenge, however, is evident from the dismal situation in government services, where women's representation is less than 15%. The situation is worse at top government posts. In a department, women are more likely to be holding lower and clerical posts, the official data shows. 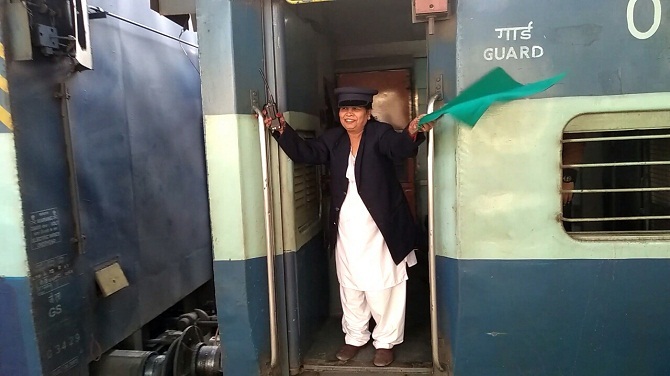 Only 7% of employees in the Indian Railways are women, according to the data. Similar is the situation in the police forces, where nationwide, only 7.3% are women in the state police, despite many states having 33% reservation for them. If one looks at some paramilitary outfits, which include the Central Reserve Police Force and the Central Industrial Security Force, their share is at 2.8%. However, in relatively sedentary and closed-office jobs such as those in banks, women fare better than the departments cited above. About 24% of positions in public sector banks are occupied by women, data from the Reserve Bank of India shows. The ratio becomes skewed if one looks at hierarchies. While women comprise more than 20% among officers and clerks in PSBs, they have an abysmally low 6% share in top posts: Executive grades and senior management, a parliamentary committee report states. "Women tend to avail of schemes that prevent transfers at the cost of promotion. The need for staying at one place is dictated by family needs, which have skewed the gender ratio across hierarchies. The situation could be worse in private banks," said a senior banker in a top PSB. About 19% of promotions in PSBs in 2015 were those of women against a 22% to 23% representation, the report shows. Yet, the gender balance in PSBs is one of the best among public jobs, some bankers said. The gender imbalance across hierarchies holds true for women in paramilitary outfits too. About 88% of women in the CRPF, CISF, Border Security Force and the like are in Group C posts, meaning clerical and helping staff. The situation is not much different in the Indian Administrative Service, Indian Police Service and other Class I services. As of 2016, 17% of serving IAS officers in India are women. While women's representation is as low as 8% in the Indian Foreign Service, it is way lower at 4% in the Indian Forest Service, according to the data compiled by the statistics ministry. "The share of women is rising in the IAS. It was near-stagnant at less than 10% at the time I had joined in the late '90s, and it comes as a relief if it has increased to 17%," said a Union joint secretary. But when it comes to top jobs that require less dynamism than scholarship, women are represented better. About 30% of officers in the Indian Economic Service and 24% in the Indian Statistical Service are women. Only about 11% of judges of the high courts and the Supreme Court are women, recent data tabled in Parliament shows. The government's flagship programme Beti Bachao Beti Padhao intends to change this from the bottom. However, the political Opposition is holding on to its promise. Sushmita Dev, president, All India Mahila Congress, said this was "mere tokenism". "With the call for reservation to women in government jobs, we have promised something tangible and measurable. Despite the issue being on their manifesto, the BJP did not introduce women's reservation Bill in their tenure," she said.